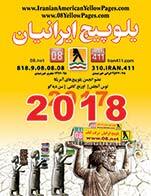 ..:: Advertise in Iranshahr Weekly ::.. Published typically in September of each year. Published typically in March of each year. 08 & 08global.net Membership Rates. * With paid advertising charges. ** No charges to caller. * For 52 weeks subscription & advertising. ** 2nd color (Red) is available for additional $ 10.00 (Cover & Back cover).